This afternoon the Los Angeles City Council was scheduled to hold its first hearing on motion 15-1006 aimed to reduce speeding and curb unsafe speed limit increases. Unfortunately the item was postponed to a future Transportation Committee meeting. Longtime readers of Streetsblog will recall that the city of Los Angeles is, to a large extent, at the mercy of car-centric California laws (outlined in the Department of Transportation – LADOT – staff report [PDF]) that essentially mandate ever-increasing speed limits. For L.A. to enforce speed limits, it must study existing speeds and raise speed limits to align with any speeding behavior encountered. The current mechanisms for setting speed limits and conducting speed enforcement were developed in an era that did not have Vision Zero as a guiding principle. Additionally, technology has evolved since the traditional methodologies were developed. Speed enforcement should reflect modern policy objectives and technological tools. I FURTHER MOVE that LADOT in consultation with LAPD report back on potential pilot projects that can be implemented quickly to reduce speeding. The analysis should include but not be limited to: innovative speed zoning practices, signal timing, enforcement practices and changes to state legislation. The committee did approve preferential parking districts, no-vehicle-sales areas, and motion 15-0701 which will allow bike parking at parking meters in Westwood. Parking meter bike parking is currently against the law in Los Angeles. Bicycle Advisory Committee chair testified that the scope of the motion should be expanded to just allow bikes to park at all meters citywide. Committee items will need to be approved by the full City Council before taking effect. I’m starting to learn how to apply the standards of traffic engineers to my everyday life. Lets take drinking for an example. I tabulate my weekly drinking and crunch the numbers. Was it excessive drinking that week? Yes? Well raise the limits! Reading the LADOT report, LADOT states “collisions have been shown to increase with artificially lowered speed limits, due to the greater variation in vehicle speed that typically results.” I checked the reference, FHWA-RD-92-084, and I don’t see support for that statement. To the contrary, the report concludes that changing the speed limit, up or down, on medium and low speed roads (i.e. not limited access highways) results in such small changes in mean speeds, that crash incidence doesn’t really change at all. In other words, changing the speed limit makes no difference in safety, because drivers drive pretty much the same no matter what. Report also states “The Federal Highway Administration (FHWA) has reported that speed limits that are set too high or too low can increase the risk of collisions.” The reference, FHWA-RD-98-154, summarizes several studies conducted internationally. Two support this conclusions; others do not. However, when crash severity is considered in addition to crash frequency, the both of the two studies cited in the FHWA report conclude that, even where crash incidence remained the same, the incident of fatal collisions increased and so did the overall severity of collisions. Neither of the cited reports indicate whether they evaluate motor vehicle only collisions or also motor vehicle collisions with pedestrians. However, the FHWA (among others) often cite the exponential relationship between vehicle speed and pedestrian fatality rates when collisions do occur. So I have to wonder whether LADOT staff actually reviewed these references before citing them. Thanks for your work figuring this out. Please contact LADOT (by a traceable method, like email or paper mail, and demand acknowledgement of receipt of the message) regarding their mis-citing of references. That’s not an acceptable thing to do and they need to be formally notified of the errors in their report. This lays the groundwork for future lawsuits, since it proves that they should have known better. And if you’re lucky they will actually listen and correct the report. You can find the full document here – http://www.fhwa.dot.gov/publications/research/safety/98154/speed.cfm#intro. It has a lot of interesting stuff, like discussing the effectiveness of different enforcement measures, traffic calming, and the difference in speeds and speed limits on limited access freeways versus surface streets. It also discusses the difference between crash frequency and crash severity. The biggest problem, IMO, is that the 85th percentile speed method of setting speed limits cannot directly account for pedestrians or slow moving vehicles, because it doesn’t measure speed generally, but “free-flowing speed.” The Caltrans speed limit manual goes into greater detail, but basically “free-flowing speed” is vehicle movement unaffected by slow moving vehicles, cross streets, driveways, pedestrians, bicycles, or slow-moving vehicles. California first measures free-flowing speeds, takes the 85th percentile, maybe rounds down, and them possibly lowers the speed another 5 mph to account for things like pedestrians, bicycles, and uncontrolled intersections. As a result, you can get free-flowing 85th percentile speeds up to 7 mph higher than the speed limit, which is why people complain about speeding on their streets. 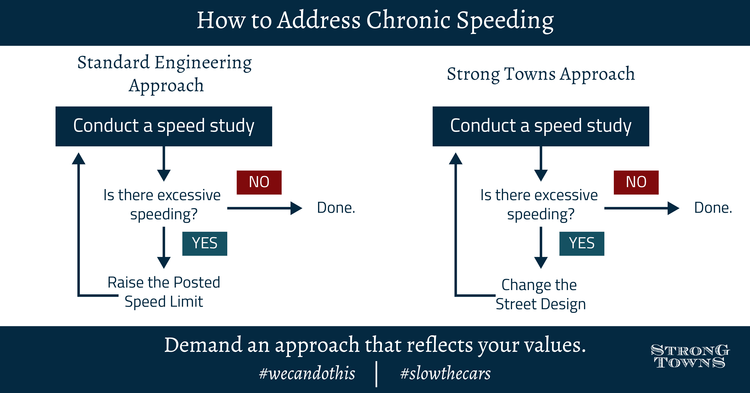 Under the feedback loop approach, you would then look at traffic calming methods to bring speeds down to what you want them to be, which is actually better for everyone because you can time the lights correctly. The reality, however, is that it takes a really long time to implement any street project and, if you have to go back and institute traffic calming measures after completing a project it could be 20 years. because anything happens.